The world championships are set to start under a cloud of controversy for British fans after it emerged that FINA had yet to ratify Adam Peaty’s 50m breaststroke World Record, set at last year’s European Championships. After nearly a year had passed since the mark of 26.62 was recorded in the semi finals in Berlin, it transpired that problems with the related doping control have prevented the record from being made official. It seems that Peaty’s sample was not tested for EPO, as is required, due to an administrative error by LEN, the European governing body, and as such the record cannot be ratified by FINA. Why it has taken so long for this to be confirmed, and why in the intervening period the existing provisions in the rules to allow the B sample to be retrospectively tested have not been implemented, is not clear, but it does appear that Peaty has become the latest victim of the laissez-faire attitude of FINA when it comes to applying their own rules and procedures in relation to records. 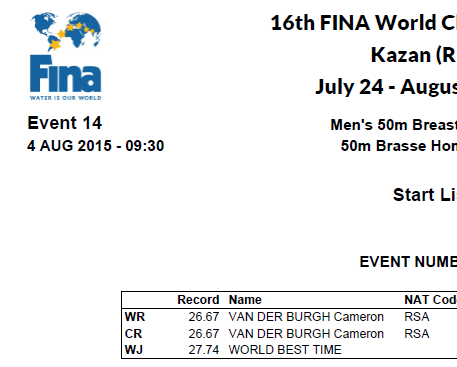 Cameron van der Burgh keeps his record, for now at least. 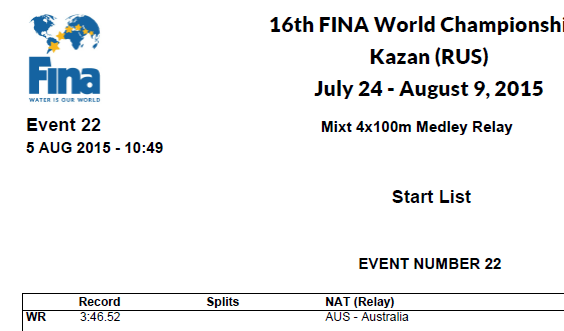 But Peaty’s was not the only British world record set in Berlin and at this point the plot thickens. The mixed medley quartet of Chris Walker-Hebborn, Peaty, Jemma Lowe and Francesca Halsall also set a global mark by some 2.6s, but are also yet to have their achievement recognised. One would assume a similar administrative bungle had ensued with the doping control, but this is the strange part – LEN have ratified this performance as a European Record even though the slower World Record still stands to Australia. Stranger still, LEN has not ratified Peaty’s 50m record as a European mark, suggesting they were aware of the potential issue and indicating that they, at least, don’t see there being a similar case to answer for the relay quartet. All of which leaves a sense of incompetence hanging around both governing bodies. Nor does it reflect especially well on British Swimming, who have recognised the marks as British Records, but who don’t appear to have followed up with FINA. “I’ve heard nothing,” British Swimming chief David Sparkes told the Associated Press. “We’ll decide when they tell us why they have not ratified it. There are a range of options open to us.” An appeal to CAS seems the most logical solution in that case. As for Peaty, whose 100m world record is unaffected by these shenanigans, he could solve the issue by going out and setting a PB this week, rendering he arguments academic. For the relay team, they could well miss out on a World record certificate though no fault of their own.